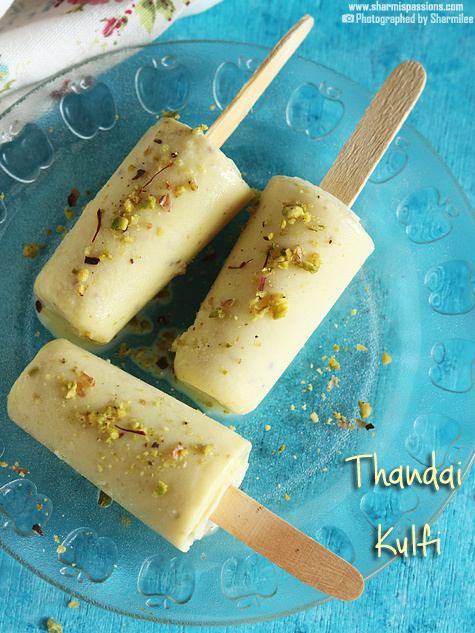 Thandai kulfi recipe with step by step photos.Kulfi is basically a frozen creamy dessert with milk and nuts as base, this is thandai kulfi with a flavour of thandai masala. 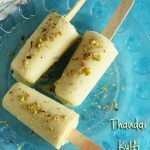 There are different types of Thandai kulfi recipes, I have already posted malai kulfi, mango kulfi, kesar badam kulfi etc.This thandai kulfi has a unique taste with thandai flavouring. 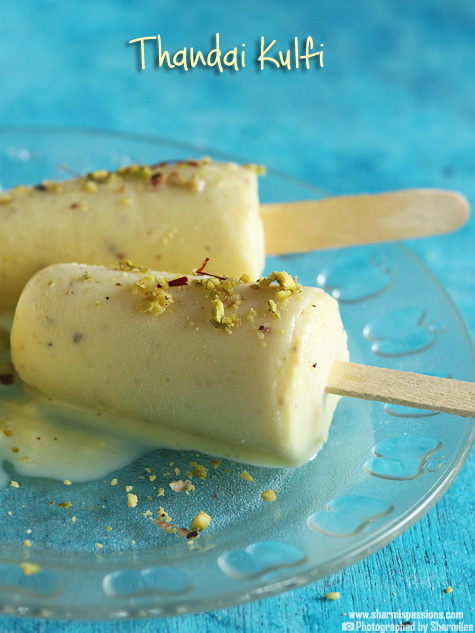 kulfi recipe with thandai flavour. Grind together sugar,almonds,pistachios,saffron and cardamom together to a slightly coarse mixture,Set aside.Boil milk in a pan. Simmer for 15 mins till milk reduces.Stir in between to avoid burning at the bottom.Now add nuts sugar mixture. 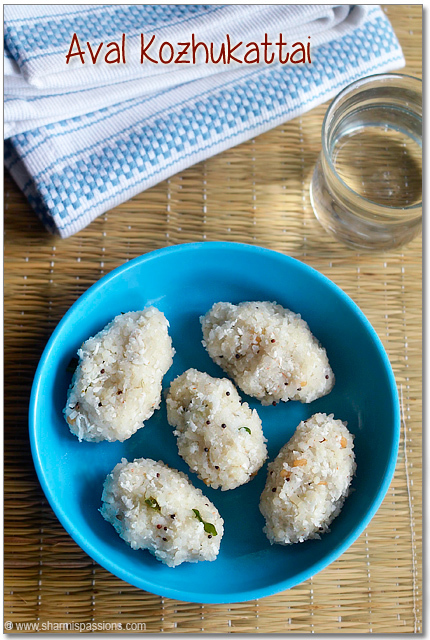 Add khoya and cook for few more mins.Malai will start collecting. 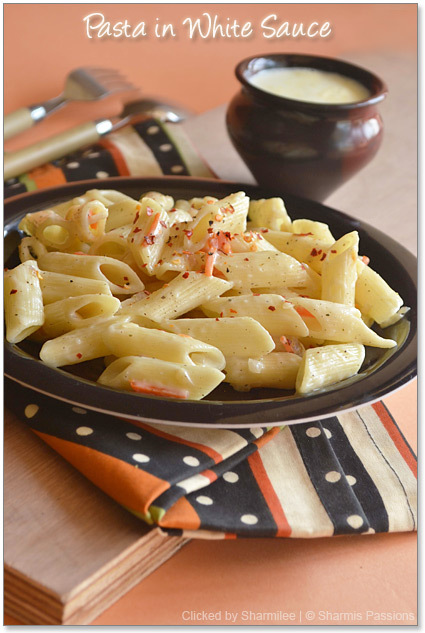 Scrap the sides and keep cooking till the mixture is thick and creamy like shown below. Keep cooking. till it coats the laddle as shown..Cool down completely.Then pour it in kulfi moulds / popsicle moulds…I used my kulfi shaped popsicle moulds. Wrap with silver foil,insert icecream stick and freeze for 6-8 hrs atleast, I always freeze it overnight.Then show the popsicles side part under running tap water.Slowly remove the kulfis and serve. Cornflour mixed with milk is added to thicken milk faster but that can be skipped too. 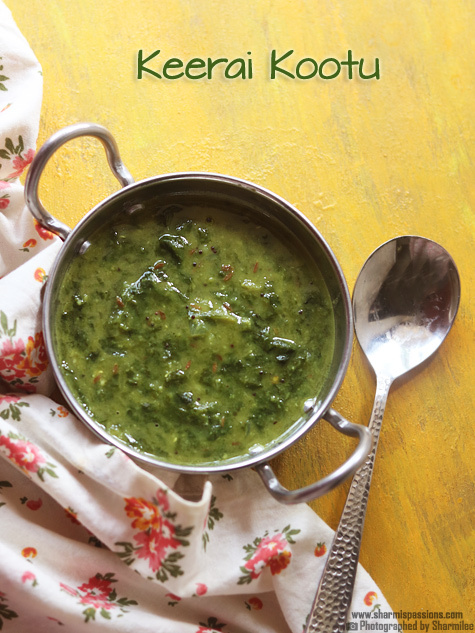 Add thandai masala powder as per your preference.If you want a strong flavour add around 2 tbsp. 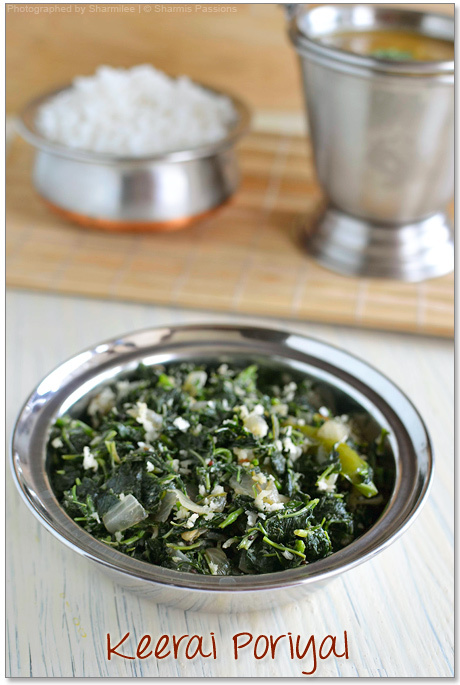 If you don't have thandai masala powder check here to make it instantly. Dont have a popsicle mould?! dont worry use disposable plastic cups or even thick paper cups cling wrap aluminium foil and us icecream sticks and freeze it.It demoulds easily or you can even cut the cups,tear it to get the popsicles out. If you are serving only 2-3 popsicles and want the rest to be stored then again close it with aluminum foil and freeze it. For easy demoulding - show the popsicle moulds in running tap water, then pull the stick out slowly to get the ice pops clean. Grind together sugar,almonds,pistachios together to a slightly coarse mixture,Set aside.Get ready with your thandai masala powder.If you don’t have it in stock then check instant thandai recipe. Boil milk in a pan.Simmer for 15 mins till milk reduces.Stir in between to avoid burning at the bottom.Now add thandai masala powder.Let it boil for a good 5mins. Now strain then again add milk to the pan and add nuts sugar mixture.Add saffron. Keep cooking in low flame.Ina separate bowl take cornflour along with a tbsp of milk.Mix well to form a smooth runny paste. Now add the cornflour mixture.Keep cooking till it coats the laddle as shown. 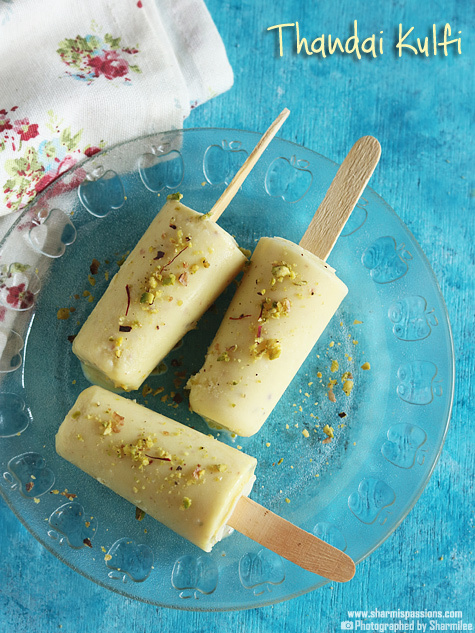 Cool down completely.Then pour it in kulfi moulds / popsicle moulds…I used my kulfi shaped popsicle moulds.Wrap with silver foil,insert icecream stick and freeze for 6-8 hrs atleast, I always freeze it overnight. Then show the popsicles side part under running tap water.Slowly remove the kulfis and serve. with crushed pistachios. 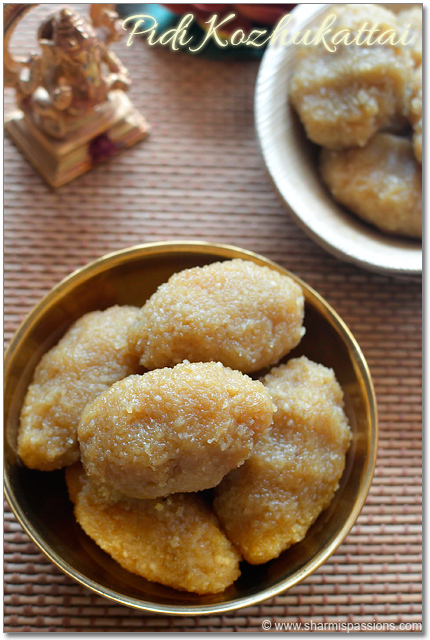 One of the best summer desserts that you and your kids can enjoy!! 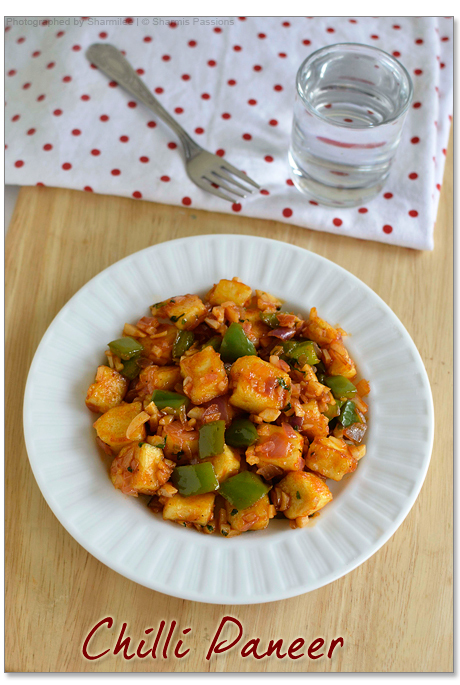 Must try recipe. Good work. 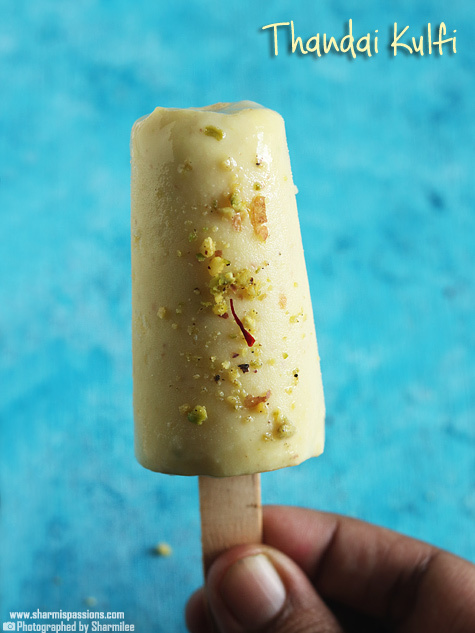 Ur malai kulfi and thandai kulfi procedures are interchanged. Pls check it.